The article examines whether labour market outcomes like employment, wages, returns to self-employment and social protection are contributing to make economic growth inclusive in countries of South Asia. Although the term inclusion may be conceptualized in different ways, it is important to focus on both the process and outcome. While the process of inclusion can be captured through measures relating to employment, the outcomes can be assessed in terms of poverty, inequality or other dimensions of human development like education and health. Another important element of inclusion is the degree of social protection provided by a society. Characterized this way, labour market outcomes are of direct relevance for inclusive growth. A number of questions may be raised in this context: (a) Is economic growth leading to the growth of productive employment that is needed for absorbing the new members of the labour force and for transferring workers from sectors characterized by low productivity to those with higher productivity? (b) Is sector composition of employment changing in a way that contributes to poverty reduction (through higher incomes of workers)? (c) Is access to social protection expanding along with economic growth? (d) Is economic growth associated with the growth of labour productivity and rise in real wages? and (e) Are real wages rising to contribute to reduction in poverty and inequality? The present paper attempts to address some of the above questions with a particular focus on the experience of the countries of South Asia. Using the concept of employment elasticity with respect to output growth, it shows that the labour absorptive capacity of the countries of the region has been low and has declined. The process of transformation of the structure of employment has been slow, and as a result, the informal economy has remained the predominant source of jobs for the growing labour force. That, in turn, has meant limited access to social protection because there is a negative relationship between the proportion of employment in the informal economy and access to social protection. Furthermore, the relationship between access to social protection and economic growth has not been linear, thus indicating that growth alone cannot be relied upon to address the issue. Public policy is also important. On the positive side, in some countries, real wages have registered increases in some sectors, especially in agriculture—showing potential for making contribution to poverty reduction. But the rise in real wages has not been sustained in recent years and has lagged behind that of labour productivity. As a result, there has not been much impact on growing income inequality. Gender differences in wages have also persisted. On the whole, it seems that labour market outcomes in South Asia have not moved in a direction needed to make economic growth more inclusive. This contrasts with the experience of countries of East and South-East Asia, e.g. Republic of Korea, Malaysia and Taiwan (China), that have been successful in attaining economic growth with productive employment and rapid rate of poverty reduction. 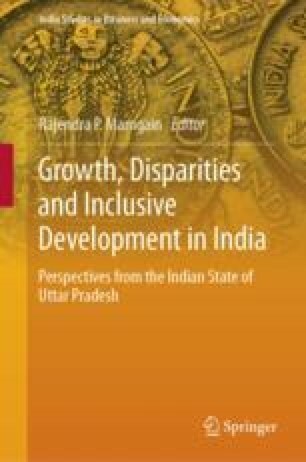 The findings of this paper could be useful to India and more specifically to the state of Uttar Pradesh in accelerating inclusive growth. OECD. (2006). OECD employment outlook 2006. Retrieved from www.oecd.org/employment/emp/oecdemploymentoutlook2006.htm. OECD. (2008). OECD employment outlook 2008. Retrieved from www.oecd.org/employment/emp/oecdemploymentoutlook2008.htm.